many of you know david aka 7drank9 from the magic the gathering community. his approach to the game is unlike any other. his deckbuilding will often serve as more art project than functional killing machine. he is an ambassador for the game's past and present. on february first, david received blood test results showing that he had an extremely low white blood cell count and was referred for more tests. when the subsequent tests came back the result was the unthnkible: acute lymphoblastic leukaemia. david is lucky to live in a place with access to great healthcare, but with this type of diagnosis, medical care is only a small piece of the puzzle. the reality is that his family will have to deal with loss of income, travel expenses to and from the specialists, child care, and many other factors that come with this type of journey. kevin (@citystroker) met david on instagram, where where david pairs magic cards with beers from all over the world. kevin had a few beers one night and messaged him a picture of my miller high life and asked him what the worst card ever printed was (to pair with his worst beer ever). they chatted and ended up trying skype games after a month or two. since then they have played on and off for nearly two years and have become good friends in the process. when kevin received the news of david’s condition he was at a loss. he really wanted to help and wanted to get magic and the mtg instagram community involved. 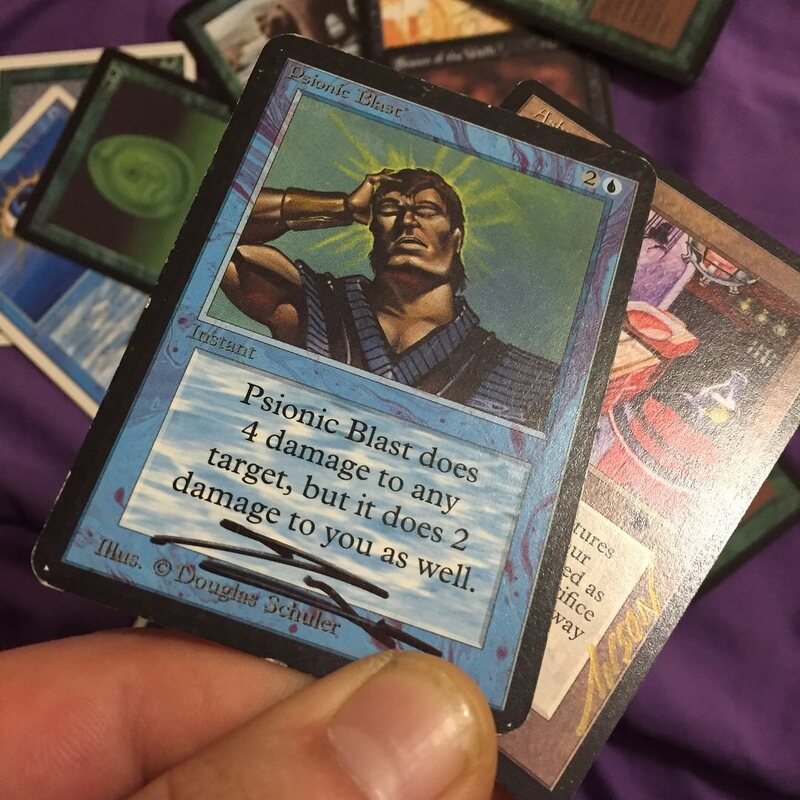 to accomplish this he came up with the idea to have a raffle for magic cards for those who donate to his gofundme. hopefully, together we can raise lots of money to help him and his family and get lots of cool cards in the process! you can find the rules, information, and prizes below. additionally, a donation of any size will earn you a random BONUS PRIZE. everyone wins! you got nothing to lose! currently the prize pool includes rare cards (transmute artifact, blood moon, hazeson tamar), signed cards (alpha psionic blast), one of a kind original artist proofs (anson maddocks), original artist alters (amy weber), playmats, altered cards (@terrible_alters, @capn_lupo, @msjalters, @shivanalteredart, @evolving_alters), and more. NEW PRIZES ARE POSTED! check it out! as a bonus, everyone who participates in the raffle will get one random, sealed envelope consolation prize. this will be a mix of good stuff and quirky commons. everyone wins! we are still accepting donations for the raffle, but what we have collected thus far is truly amazing, and includes things we have never seen before. every little bit helps so if you would like to donate, shoot an email over to magic4david@gmail.com or touch base via instagram with @magic4david.